A political change of direction is necessary. Substantial public investment for social services, education, science, culture and infrastructure is needed now more than ever. This can be achieved immediately by using the tax surplus accordingly, by consistently fighting tax evasion by the rich and super-rich and: by ending austerity. Austerity limits public spending and thus destroys opportunities for public development. Austerity has been implemented for the federal government since 2016 and will be binding for the states from 2020 onwards. Austerity is an obstacle for progress and therefore must be abandoned. Human productivity today is already large enough that e.g. the global agricultural output could sufficiently nourish 12.5 billion people. At the same time the wealthiest one percent own as much as the remaining 99% combined. In Germany roughly 1100 families own over one third of the gross domestic product (~ 1.07 trillion Euros) while the poorer half of the population owns hardly one percent of the total wealth. Social life, meaningful work and culture could prosper everywhere. But despite the daily increase in material and intellectual richness produced by the many it decreasingly serves the wellbeing of the greater good. Instead, this richness is being depraved to obscene profits and power in the hands of a select few. The main reason for this development is a set of policies that redistribute wealth from the bottom to the top. This cynical process robs people all around the world of their livelihood and development opportunities. The political purpose of austerity is to maintain this process. Therefore, it must be abolished: ”Human dignity is inviolable. To respect and protect it shall be the duty of all public authority“ (German Constitution, Art. 1). Progress needs social movement! Creating humane living conditions is our common goal! A dignified life for all, without war, poverty and hunger, with free education and social participation for all, meaningful work in social security, public health services free from the requirement to be profitable, affordable and decent housing for all, public theatres and museums, independent sciences for the public good, people-oriented administration and social services, sustainable mobility, energy and water supply for all – it is all possible today on a global scale. This is not charity, but instead a necessity for all humankind. After the ”global financial crisis“ in 2008, when banks were ”saved“ by enormous amounts ofpublic money, the whole world could see: there is plenty of money! The policies of wageless work, privatisation of public goods, the deregulating of businesses, tax exemptions for international corporations and increased work-place competition (”flexibilisation“) turns out to be what they have always been: the vile pillaging of the majority for the profits of the few. The propagated trust in the ”self-regulation of the markets“, the great ”increasers of the common good“ of the private sector and the higher meaning of ”tighten your belt“ lost all its legitimation in a sudden. Ever since, increasing numbers of people have voiced their desire for a change to solidarity and advocate a socially and culturally dignified life for all. 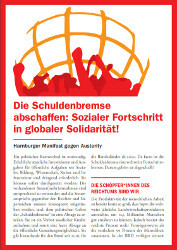 Countering this positive alternative the ruling class has tried to keep up the myth of the „End of History“: the systematic deprivation of the public will and austerity were made constitutional requirements – in Germany the so-called „Schuldenbremse“. Ideologically based on a system of lies, austerity tries to make us believe that any demands towards the welfare state beyond those existing today have a negative impact on the common good. Yet, a dynamic development of our social life has never been more necessary and possible. Truth be told! 1. Public debt is not the problem. The development of the public good has always lead to increased productivity. The initial investments are regained two to three-fold. The state is financially and fiscally independent. It can increase its tax revenue and, if needed, increase the money supply (assuming increased productivity), thus financing itself. 2. Public debt is only an issue if you accept the power of the banks which are able to blackmail the state in cases of high debt. The political sovereignty of the state over the banking sector has to be re-established. Deregulating the financial markets was a reversible political error. Banks are constitutionally bound to the common good. They have no legal entitlement to profits. If they threaten the state or the public good they can be expropriated (German Constitution, Art. 15). 3. The current high levels of public debt are not caused by an overblown welfare state. They are mainly caused by bailing out banks, by the immense tax exemptions for large capital owners introduced in the last 20 years and by a dismantled welfare state. Higher wages, investments in education, culture, public social infrastructure and social security programmes, like non-deductible basic social security benefits and a decent minimal pension for all would mean increased innovation, direct economic growth, higher buying power and thus exponentially growing tax revenue for the state. At the same time such measures would relieve international relationships. All this is not only necessary and obligatory for the state (German Constitution, Art. 20) but also economically viable. 4. A well-educated society knows best what is good for itself – not some technocrats, who cannot or do not want to distinguish between profit and the common good, thus undermining the foundations of social development. Sovereignty to collectively control social development is the basis of a democratic society. Austerity removes this fundamental right from the public – not only in Greece. As long as the decision-making authority is not with the democratically elected institutions, political ignorance, authoritarian demons and extremist right-wing ideologies will thrive. Austerity has nothing to do with realising fundamental and human rights nor with the constitution. Abolishing austerity means reinstating democracy. Democracy needs critical, enlightened, cultivated, demanding and committed co-operatively responsible citizens in solidarity. Let’s take history into our own hands! 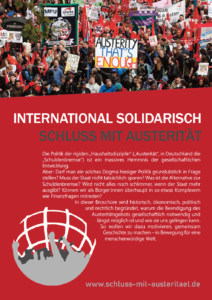 ► to begin a nationwide initiative to remove austerity from the German constitution. To our friends around the world, in Europe, in other federal states and communities we call out: Rise up with us! Fight with us for the abolition of austerity from the constitution and from all European treaties. Let us end austerity for a better life in peace, dignity and prosperous development, now!